When the proceedings of the first day of Itikaf got under way after the Fajr prayers, the participants of Itikaf in the courtyard of the Mosque were waiting for time to offer optional prayers of ‘Ishraq’ in the ‘Itikaf City’, a place characterized by understanding of religion, purgation of self, and repentance. A person named Salman told that he belonged to Lahore and the all of his family members were participating in the Itikaf. He told that they participated in the 10-day long Itikaf activities each year and this practice has been on for last 13 years or so. The attendance of people during this year’s Itikaf has broken all previous records. Held under the spiritual blessings of ‘Darbar-e-Ghosia’, the Itikaf City had people engaged in performance of religious activities and rituals. They were reciting the Holy Qur’an in the hall of Mosque during the rest time. People were also crowding the ‘Darbar-e-Ghosia’ to offer Fateha. The Mosque was swarmed with the faithful when the hour of offering ‘Chasht’ prayers came. After the offering of Zuhar prayers, people joined different collective training camps, which are eight in total this year. The training camps under the watch of Rana Muhammad Idrees Qadri and Hafiz Saeed Raza Baghdadi were being held in the courtyard of the Mosque. Windstorm suddenly overtook city at 3 pm, whose ferocity increased when coupled with heavy rain that lashed through the Lahore city. The various tents installed in the open ground adjacent to Jamia al-Minhaj got uprooted as they could not face the raging windstorm. Seeing this, people lodging in the courtyard of the Mosque and those under places with temporary roof structures erected above started vacating these places. On the other hand, the administration declared emergency as a precautionary measure and opened the gate of ‘Itikaf Gah’ for the participants to enter the safe places. When the intensity of storm increased, it caused partial damage to the makeshift structures over the courtyard of Mosque. 12 pillars that held the temporary roof structure aloft started getting uprooted gradually with the result that the roof did not collapse all of a sudden, rather the process of collapse took two to three minutes to complete. This provided people with enough time to withdraw themselves from the affected place. Before roof could collapse entirely, people had already taken refuge to safe places. Only three people sustained minor injuries and they were given free medical aid. One person who was sleeping in the courtyard was seriously injured and died of the wounds. People started the rescue operations on their own with the cooperation of the administration. During the rescue and relief efforts, the media representatives, ambulance service and rescue personnel were present outside the premises of Jamia al-Minhaj. Initially, the electronic channels misreported the event of collapse of roof structure and blew the loss out of proportions. After having handled the crisis, Nazim-e-Ala Dr Raheeq Ahmad Abbasi, naib Nazim-e-Ala Sheikh Zahid Fayyaz and Director Media Dr Shahid Mahmood informed the people of the actual state of affairs through a live press conference. Nazim-a-Ala told the press that the windstorm and heavy rain caused the roof structure to collapse, injuring three people who have been given medical aid. He said we have brought situation under our control with help of our workers and participants of Itikaf. There was no emergency anymore. Rain continued till evening prayer but the management controlled the situation. The participants of Itikaf City showed exemplar attitude, keeping their cool in such trying times. People sheltered their affected brethren in faith. Thus all of the participants remained entirely safe. Iftari food had already reached before fast-breaking. People were ecstatic and offering salutation and durood on the Holy Prophet (saw) in chorus. Seeing the spirits of people, one could hardly say that they had faced any emergency situation a few hours ago. On the other hand, no damage was caused to Itikaf city on the women side except the uprooting of a few tents. The workers of Youth League and rescue operatives remained on the alert despite this. All women were safe for being accommodated in buildings. 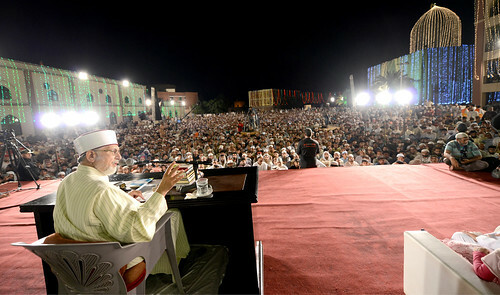 After the Taravih prayers, the sound system, which was out of order due to rain and windstorm, was repaired along with the projectors, which were installed in the basement of courtyard of the Mosque to enable people to listen to the address of Shaykh-ul-Islam Dr Muhammad Tahir-ul-Qadri.